WebReus Review 2019: Is WebReus a Good Hosting? WebReus is a website hosting company based in the Netherlands. Established in 1993, the company is made up of specialists in Linux hosting solutions for small, medium-sized, and large business enterprises. 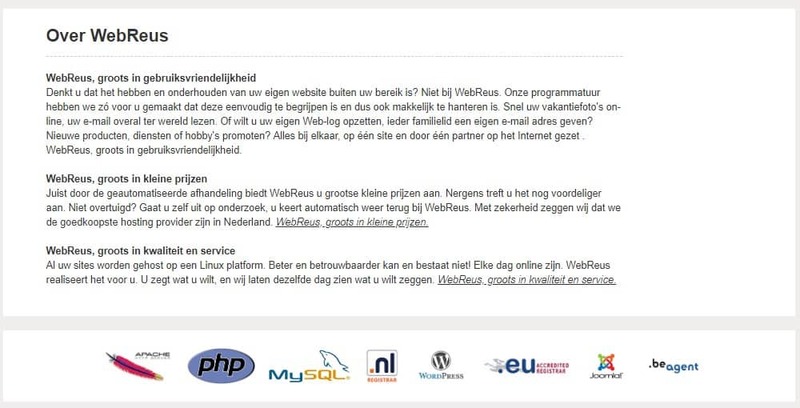 WebReus is a small Dutch-based web hosting vendor with headquarters in Eindhoven, Netherlands. The company was founded in 1993 and focuses on the provision of shared hosting and domain name registration services to businesses of all sizes in the Netherlands as well as Belgium, France, Italy, and India. 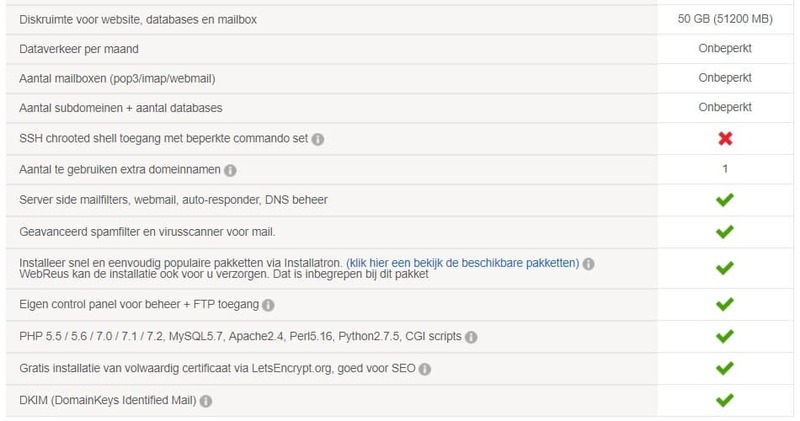 The WebReus website is only available in Dutch. All WebReus websites are hosted on the Linux operating system platform. The company offers three shared hosting plans designed to deliver fast websites. Allround is their starter package and is ideal for hosting simple websites from small enterprises. The plan includes 10GB disk space, 500GB bandwidth, one MySQL database, and unlimited mailboxes. On the other hand, the Giant package is designed for large websites and comes with more advanced features such as 100GB disk space, unlimited bandwidth, free full certificate https, SSH, and Webdav as well as remote MySQL access. WebReus performs automatic backup services for its clients’ data. However, a number of users have expressed their dissatisfaction with WebReus servers, which are said to constantly fail, leaving customers stranded with no way of recovering their data for business continuity. The WebReus website is easy to navigate and everything is easily visible and accessible from the home page. The vendor’s hosting platform uses the Plesk control panel and the packages support PHP, Apache, MySQL, PostgreSQL, Python, Perl, and Apache-ASP. Installatron is also included with all web hosting packages. With this you can quickly install all popular scripts, including Joomla and WordPress. WebReus shared hosting packages are quite pocket-friendly. What’s more, the features offered from one package to the next scale well with price. Prices of the hosting plans are listed in euros. WebReus has an inflexible billing cycle where customers make annual payments of their preferred plans. The vendor does not have a refund policy or any uptime network guarantee for its services. You can reach the WebReus support team via the ticketing system. It does not provide phone support and has no live chat. The ticketing system is only available to already existing customers. This means that potential customers would have to buy a hosting plan first to get access to the vendor’s ticketing system. Sadly, existing customers complain that the support team is arrogant and condescending. The WebReus website has a knowledge base that includes video tutorials. A close look at WebReus reveals that the vendor has not set aside adequate resources to host large websites that have complex databases. What’s more, the somewhat basic features would only be suitable for hosting small and medium-sized businesses. Customers looking for VPS and dedicated servers would have to look elsewhere. Wondering how WebReus stacks up against other Web Hosting companies? Enter any other Web Hosting company and we will give you a side-by-side comparison.